But that number is still far too few to convince scientists that the population is rebounding. “Without concerted efforts to reduce the effects of human activities, this species is likely to go functionally extinct in about 20 years,” Scott Kraus, senior science advisor at the New England Aquarium, said during testimony March 7 at a congressional hearing examining the threats to right whales. “Until the average calving rate is over 10, I’m not going to feel confident,” said Robert Kenney, a marine mammal researcher and retired marine scientist at the University of Rhode Island’s Graduate School of Oceanography. 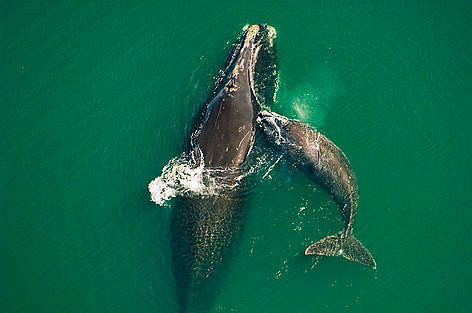 Kenney said the most likely explanation for the reduced birth rate is that female right whales aren’t finding enough to eat, resulting in a longer interval between pregnancies. “Female right whales nurse their calves for a year, then they take a year off to recover and build up their fat, and then they get pregnant again,” he said. The uptick in the birth rate this year is probably an indication of successful feeding in 2016 and 2017, according to Kenney. The other side of the right whale story is the high mortality rate. According to Kraus, from 2010 to 2014 the rate of right whale deaths or serious injuries due to human activities doubled that of the previous decade. In 2017 and 2018, 20 right whales are known to have died, mostly as a result of ship strikes and entanglements in fishing gear, reducing the total population by nearly 5 percent. The actual number of deaths each year is probably far greater than the documented deaths. “This type of rapid decline in the population has not been seen since the period of active right whaling prior to 1750,” Kraus said. Fifteen years ago, the leading cause of death for right whales was collisions with large ships, but that has improved in recent years thanks to the rerouting of shipping lanes in some areas and the adoption of a reduced-speed regulation for commercial ships along the East Coast. Today, more right whales die after becoming entangled in fishing gear than from any other cause. Kraus said at least 83 percent of right whales have entanglement scars, and 59 percent have been entangled more than once. In November, Kenney published an analysis of right whale mortality since 1990 and found that if there was no fishing gear in the water, the North Atlantic right whale population would be steadily increasing. Most of the 12 right whale deaths in 2017 were caused by entanglements in fishing gear from the snow crab fishery in the Gulf of St. Lawrence between Newfoundland and New Brunswick, where fishermen use large pots and heavy ropes that easily entangle whales. Kenney said that is an area that few right whales used to visit until food became scarce elsewhere in recent years. “Last year, the Canadian government took action — they were much more responsive than the American government has ever been — and closed down the fishery as soon as the right whales showed up,” Kenney said. As a result, no right whale deaths were recorded in the Gulf of St. Lawrence last year. Both Kenney and Kraus also noted another big concern facing the right whale population: much shorter life spans. The whales, which formerly lived more than 70 years, now have a life expectancy of just 30 to 40 years because of human-caused mortality. And females are dying much earlier than males, reducing the number of calves they can produce in their lifetime. “It’s unlikely that right whales die of old age anymore,” Kraus said. What can be done to reduce the mortality rate? The scientists say the first step is the development of “ropeless” fishing. “The number and severity of entanglements is going up, probably due to improvements in rope strength and rope quality,” Kenney said. “Ropes are stronger and lasting longer, which is good for fishermen but not good for whales. If the entanglement issue can be resolved, then the whales may be able to find a way to recover on their own.